As of the end of September 2015, the Global Geoparks Network (GGN) comprised 120 sites in 33 countries. * One of the San’in Kaigan Geopark’s sister geoparks is the Petrified Forest of Lesvos (Greece). 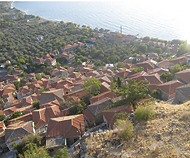 In February 2011, the San’in Kaigan Geopark and the Lesvos Geopark signed a sister-geopark agreement. The two geoparks are going to cooperate with each other in information exchange concerning the conservation and utilization of resources and in the dissemination and promotion of geoparks. 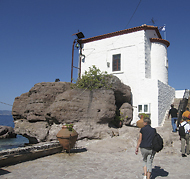 Having joined the GGN shortly after its founding, the Lesvos Geopark is one of the leading global geoparks. Its most outstanding feature is the forest that submerged and fossilized as it was. Located in Sigri, a town in the west of Lesvos Island, the Natural History Museum of the Lesvos Petrified Forest featuring modern and stylish exhibitions provides various kinds of information concerning the Lesvos Geopark. One of the biggest sequoia trees fossilized upright, this silicified tree is 7.02 m high and 8.5 m around.